Darien Police are looking for a man who has robbed a Bank of America. A surveillance camera captured this image. Surveillance cameras captured clear images of a man wearing a yarmulke who robbed a bank in Darien, Connecticut on Monday. Police say he hit the Bank of America on Sedgwick Avenue and walked away with an undisclosed amount of cash. He was last seen exiting Goodwives Shopping Center next to the bank. The man demanded the money without showing a note, and without threatening the teller with a gun, police told NBCNewYork. Witnesses describe the bank robber as approximately 50 years old, 5'9, and 170 pounds. Short, gray hair stuck out from under his bright, blue yarmulke. Police said that they believe the man is probably not from the Darien area since he didn't take the time to protect his identify with a disguise. 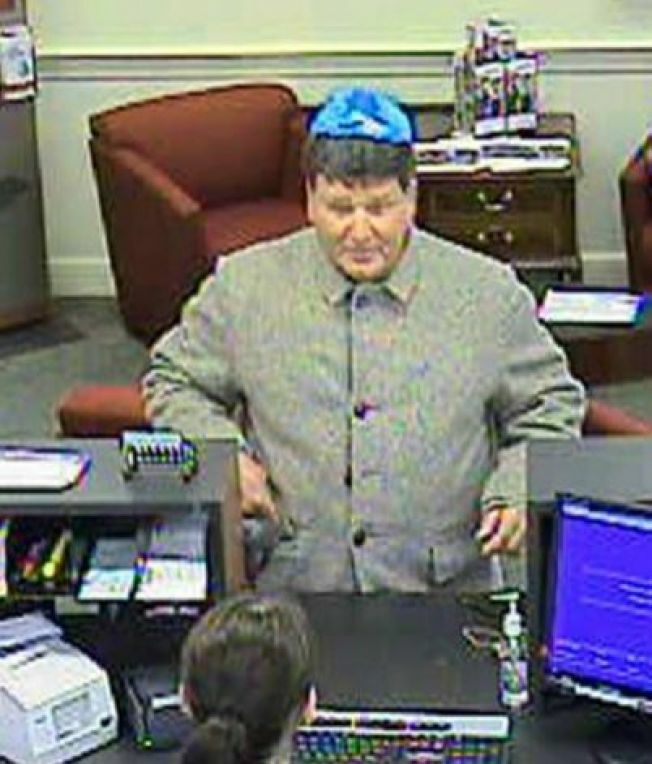 If anyone has any information about the bank robbery suspect, call Darien Police at 203-662-5330.